Long-term services and supports (LTSS) may involve, but are distinct from, medical care for older people and adults with disabilities. Definitions of the term vary, but in this report, we define LTSS as assistance with activities of daily living (ADLs) and instrumental activities of daily living provided to older people and other adults with disabilities who cannot perform these activities on their own due to a physical, cognitive, or chronic health condition that is expected to continue for an extended period, typically 90 days or more. LTSS include human assistance, supervision, cueing and standby assistance, assistive technologies and devices and environmental modifications, health maintenance tasks (e.g., medication management), information, and care and service coordination for people who live in their own home, a residential setting, or a nursing facility. 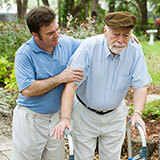 LTSS also include supports provided to family members and other unpaid caregivers. Individuals with LTSS needs may also have chronic conditions that require health or medical services. In a high-performing system, LTSS are coordinated with housing, transportation, and health/medical services, especially during periods of transition among acute, postacute, and other settings. For the purpose of this Scorecard, people whose need for LTSS arises from intellectual disabilities (ID) or chronic mental illness (CMI) are not included in our assessment of state performance. The LTSS needs for these populations are substantively different from the LTSS needs of older people and adults with physical disabilities. Including services specific to the ID and CMI populations would have required substantial additional data collection, which was beyond the scope of this project. What is the Long-Term Services and Supports Scorecard? The Long-Term Services and Supports Scorecard (LTSS Scorecard) is a unique ranking and policy tool designed to inform people and policy makers about how states have developed LTSS systems to meet the needs of older adults, adults with physical disabilities, and family caregivers. The Scorecard website includes performance rankings of the 50 states (and the District of Columbia) overall and within five different dimensions: Affordability and Access, Choice of Setting and Provider, Quality of Life and Quality of Care, Support for Family Caregivers, and Effective Transitions. The rankings are derived from 25 indicators that measure state performance. You can interact with the data from the latest Scorecard using the map and tools to drill into indicators for a single state or compare state performance on selected indicators. In addition to the state rankings, the Scorecard website includes a series of briefs on promising practices and emerging innovations. These briefs describe various strategies, practices, and tools states can adopt to improve the lives and well-being for older adults and people with physical disabilities, and their family caregivers. Additional case studies and reports are also available on the website. assess progress in closing performance gaps. Policies at the state level play a huge role in shaping the LTSS system. States rely heavily on federal funding—including Medicaid and the Older Americans Act—to finance LTSS, but these programs are administered at the state level and, consequently, vary widely. Nursing home care, for example, is a mandatory benefit under Medicaid and is provided by all states. But states have considerable flexibility to set the program rules that determine how many state residents are eligible for Medicaid assistance with the cost of nursing home care. States also have an array of options in Medicaid for providing home- and community-based alternatives to nursing home care. Beyond Medicaid, states’ choices and investments also affect the design and delivery of LTSS, including supplementing access to affordable services through state-funded home care programs; consumer information, education, and outreach for aging services; respite services and other supports for family caregivers; the enforcement of federal nursing home quality standards; the regulation of private long-term care insurance; and long-term care workforce development strategies. States’ priorities and choices shape LTSS systems and how well they work for consumers and family caregivers. The Scorecard ranks state performance to provide insight into what’s working and how states can do better. How were the states ranked? To rank states, we developed five dimensions of LTSS system performance and, within each dimension, selected indicators that would meaningfully represent state performance in each dimension. We created a National Advisory Panel to help ensure that the categories correspond to the issues that matter to consumers and their families, and that categories are sensible and comprehensive. The five dimensions of LTSS system performance are (a) Affordability and Access, (b) Choice of Setting and Provider, (c) Quality of Life and Quality of Care, (d) Support for Family Caregivers, and (e) Effective Transitions. The expert panel provided input on the dimensions, the measures to be included in each category, and the data sources used. The rankings provide a meaningful comparison of state performance. However, information on some important aspects of LTSS is not available. Perhaps most important, we were unable to include measures of the quality of home- and community-based services (HCBS). Today, some states measure certain aspects of HCBS quality, but there are no standardized measures collected across all states. As a result, the quality category includes just three indicators: one that measures quality of life through the rate of employment for adults with ADL disabilities while the other two indicators measure the quality of nursing home care—despite the fact most people who need and use LTSS are living at home or in another community setting. Because the measures we could include fall short of what is needed for a comprehensive appraisal of LTSS quality, we gave the quality category less weight in the calculation of overall performance. For more information, see the methodology section of the website. National efforts are underway to improve the collection and reporting of standardized HCBS quality measures. Ideally, states will adopt a core set of standardized measures that can be used to improve programs and outcomes—and that we can use to create a more robust quality category in the next version of the LTSS Scorecard. Why did my state perform so well? The highest-performing states—ranked in the top quartile overall—are those that perform relatively well across the five dimensions of LTSS system performance. The top-performing states tend to rank high across the board. What the rankings don’t tell us is whether the state systems at the top of the Scorecard rankings deliver the outcomes we want and expect for people who need LTSS and their families. There is no absolute standard—for affordability or quality, for example—against which state performance is compared. Why did my state perform so poorly? Wide variation exists within all dimensions and on most indicators, with low-performing states being markedly different from those that score high. How can I tell if my state is improving? It is tempting to compare the three Scorecards (2011, 2014, and 2017) to see whether a state has risen through the ranks (or perhaps fallen). Unfortunately, due to changes in data and methods, the Scorecard rankings cannot be compared in this way. The best way to tell if your state is improving or declining in performance is to assess change in the indicators that are measured consistently over time. For 23 of the 25 indicators in the current Scorecard, baseline data are available to measure change over time. See the list in Exhibit 1. Change in State Performance on 23 Indicators from the Previous Scorecard to this Scorecard in the methodology section of the website. Detailed state-level change over time performance data are available in the data tables in Measuring Change in Performance. One thing to note is that we report improvement or decline in an indicator only if a measure improved or declined by 10 percent or more. In some cases, another threshold was used. For more information about how the thresholds were calculated, see Measuring Change in Performance in the methodology section of the website. For those Scorecard readers who want to assess changes in rank, please note that ranks are not directly comparable between years. There were some changes in the indicators used (i.e., new indicators were added, some indicators were dropped, there were methodological changes in some indicators, and some indicators were moved to a different dimension, changing the computation of dimension and overall ranks). In what categories did states improve the most? Overall, there was more improvement than decline in LTSS system performance between the 2014 Scorecard and the current Scorecard: nearly all states (49) had more improved than declined indicators. Many indicators were unchanged. Most states (47 or more depending on the dimension) had improved indicators in four of the five dimensions: Choice of Setting and Provider, Quality of Life and Quality of Care, Support for Family Caregivers, and Effective Transitions. States were less successful in achieving improvements in Affordability and Access (only 21 states had any improved indicators). In only 17 states did the number of improved indicators exceed the number of declined indicators for Affordability and Access. Most states did not decline, but they didn’t improve, either—they mostly stayed the same. In contrast, states typically improved in the dimension of Support for Family Caregivers. Forty-nine states improved on at least one indicator, and 42 states had more improved than declined indicators in this category. What can my state do to improve? All states have opportunities to improve LTSS system performance. Even the highest-ranked states can do better than they do today. States can use the Scorecard as a starting point for identifying opportunities for improvement and setting program and policy priorities. Since relatively few states improved in the Affordability and Access dimension, this may be an appropriate area of focus for many states. To increase the enrollment of poor and low-income people who need LTSS, state policy makers may want to consider reforms to Medicaid eligibility policies. States may also want to consider expanding outreach to populations that may be eligible for, but not enrolled in, Medicaid, including people who could benefit from community-based LTSS, for example. These eligibility expansion and outreach activities have the potential to improve state performance on several Scorecard indicators. Other reforms, however, also have the potential to improve performance on the Affordability and Access indicators. For example, states that create better HCBS systems to reach people who may need only relatively modest home care to remain independent in the community may achieve higher rates of coverage in Medicaid. One goal of the Scorecard is to shed light on high-performing states so other states can learn from their strategies and successes. On the Scorecard website, states can find a variety of reports—case studies, promising practices, emerging innovations, and others—that describe the strategies used and outcomes achieved in several high-performing and fast-improving states. Are the rankings valid and objective? We selected valid, objective, and reliable indicators to provide an overview of state performance in each dimension. Most of the indicators are derived from federal government administrative databases or surveys. These sources are considered among the most reliable because they are subject to some oversight by federal program administrators (who use the administrative data for program purposes) and social scientists who assess survey data for accuracy. The methods used to combine the data into composites and rankings are simple and transparent. We convened a National Advisory Panel of experts in LTSS to provide input on the indicators and the methods used. How recent are the data? For each indicator, the most recently available data as of January 2017 are used. The data-reporting years range from 2012 to 2016, with most indicators relying on 2015–16 data. For more information, see State LTSS Scorecard Ranking Methodology and Detailed Indicator Descriptions in the methodology section of the website. What’s new in this year’s Scorecard? How did the data change from the past Scorecard? The 2017 Scorecard relies mostly on the same indicators used in 2014. However, some indicators had to be dropped (because data were no longer available) and two new indicators were added. The major changes in the 2017 Scorecard affect three dimensions: Choice of Setting and Provider, Quality of Life and Quality of Care, and Support for Family Caregivers. In the Choice of Setting and Provider dimension, the 2017 Scorecard includes a new measure of subsidized housing opportunities. This indicator captures the total amount of subsidized housing opportunities—including Low-Income Housing Tax Credits, HOME funds, Housing Choice Vouchers, and loans and subsidies—divided by the total number of housing units in a state. In the Quality of Life and Quality of Care dimension, three of the quality measures used in the 2014 Scorecard were eliminated in this year’s Scorecard because the indicator data are no longer available or are no longer considered reliable. The Support for Family Caregivers dimension is a single policy composite that is divided into four indicators. Three of the indicators were modified to include elements from the 2014 Scorecard and are now restructured to include supports for working caregivers, the extent to which registered nurses are able to delegate health maintenance tasks to nonfamily members, caregiver assessment, and other ways in which family caregivers can be supported, for themselves and in their role as caregiver. In addition, a new indicator was added to reflect state efforts to improve transportation options for people who no longer can drive and support family caregivers. 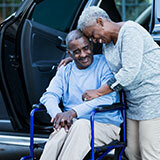 Family caregivers spend a large amount of time driving their family members with LTSS needs. The indicator measures state policies to expand volunteer driver programs through encouraging volunteerism and removing regulatory barriers; increase access to nonmedical, community transportation for low-income Medicaid beneficiaries with disabilities; and coordinate community transportation at all levels of government through human services councils. For more information on changes to the data and definitions, see the methodology section on the LTSS Scorecard website. Why is subsidized housing opportunities included as an indicator in the Choice of Setting and Provider dimension? The lack of affordable and accessible housing is a significant barrier to community integration for people who use LTSS. To assess the gaps in the availability of affordable housing across states, the 2017 Scorecard includes a measure of subsidized housing opportunities. The indicator is an overall measure of the statewide availability of affordable housing; it is not limited to people who need LTSS or who may be at risk of nursing home admission. However, states can use the measure—together with the other indicators in this dimension, including assisted living units—to assess the overall supply of community residential housing options for people who may be eligible for HCBS under Medicaid, for example. Since assisted living is often unaffordable to people with low or modest incomes, subsidized housing plays a large role for older adults and people with physical disabilities. More than half of all subsidized households are headed by a person age 62 or older or by a person with a disability. In recognition of the need for housing-related services, states increasingly are providing housing-related services under Medicaid (such as tenancy services for community-based LTSS Medicaid beneficiaries) and Medicaid agencies are partnering with housing agencies to expand housing development opportunities for HCBS beneficiaries. Without an adequate supply of subsidized housing units, states are likely to have difficulty finding housing for low-income older people and people with disabilities who do not own a home. The LTSS Scorecard was released in 2011, and updated in 2014 and 2017. The goal is to update the Scorecard every two to three years.